The Allman Brothers Band are saddened by the recent passing of our long time friend Floyd Miles. Floyd was a childhood friend of his Daytona Beach neighbors Duane and Gregg Allman. As a member of The Universals, a seminal local 60’s soul band, he was the singing drummer who schooled the Allman boys in blues, soul and R&B music. He was the friend who took them to the barber shop across the tracks to buy the discs that became the musical foundation that spawned the Allman Brothers Band. In later years he toured as a member of the Gregg Allman Band, regularly singing his song “Back To Daytona” The Allman Brothers Band family and crew will miss this family member and brother, our sincere heartfelt sorrow go out to the Miles family. This year's Peach Music Festival lineup has been announced and it's a knockout! Phil Lesh, Gov't Mule, Joe Russo's Almost Dead... and the return of Dickey Betts and his Band! Jaimoe's Jasssz Band, Devon Allman's band featuring Duane Betts, wake up with Warren Haynes... the list goes on and on, this is one you can't miss! This weekend only -- through January 14 -- special Lineup Announcement Earlybird pricing - check it out and http://peachmusicfest.com. 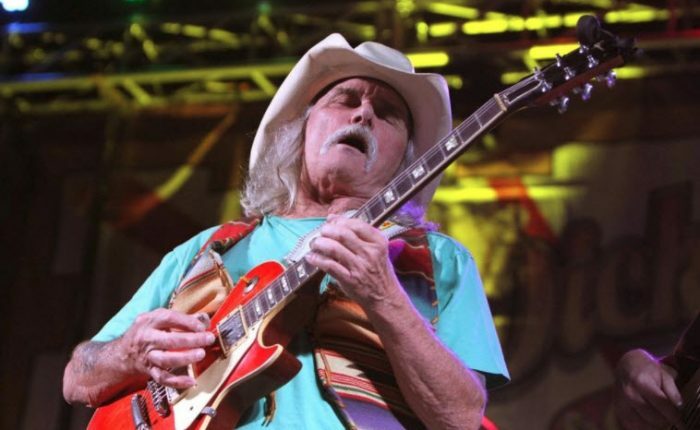 Dickey Betts announced today, on his birthday, December 12, that he will return to the road for a select group of dates in 2018. The 2018 concert dates will feature Betts peppering his setlists with songs written by Gregg Allman, whose credits include “Midnight Rider,” “Melissa” and “Whipping Post.” The 23-minute live version of “Whipping Post” from the Allman Brothers Band’s masterful, breakthrough album “At Fillmore East” famously features the dual lead guitar playing of Betts and Duane Allman. “I think the fans deserve to hear a few of Gregg’s song as well, so I’m pulling out some classics,” Betts said. The Dickey Betts Band hitting the road in 2018 will consist of Dickey and son Duane sharing lead guitar duties. Wanee Music Festival 2018 Lineup & Tickets On Sale Now! Here it is -- the Wanee 2018 lineup announcement!